Clear out the Shenandoah Valley “clean and clear,” Union General-in-Chief Ulysses S. Grant ordered in the late summer of 1864. His man for the job: Major General “Little Phil” Sheridan, the bandy-legged Irishman who’d proven himself just the kind of scrapper Grant loved. Grant turned Sheridan loose across Virginia’s most vital landscape, the breadbasket of the Confederacy. Historians Daniel Davis and Philip Greenwalt, longtime students of the Civil War, have spent countless hours researching the Valley battles of ‘64 and walking the ground where those battles unfolded. 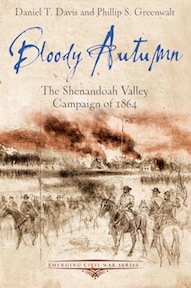 Bloody Autumn: The Shenandoah Valley Campaign of 1864 shifts attention away from Army of the Potomac and the Army of Northern Virginia to the campaign that ultimately determined the balance of power across the Eastern Theater.